Q: What services does Higher Standards, LLC provide to improve long term care quality and assisted living quality? We deliver our unique 9-module dining service training workshop for your food servers, direct-care workers and managers. We deliver our licensed Train the Corporate Instructor (TCI) program, which offers companies the option to implement on-going service improvement by developing Kind Dining® in-house trainers. In addition, consultation by phone and on-site is available. Q: Quality of nursing home care. How do I know my servers are getting the right training to prepare for QIS surveys? Kind Dining® training presents ways to develop relational skills and demonstrates technical skills for proper meal service. On-going training and coaching of these skills helps servers confidently pass state and federal person-centered care surveys. It enhances the nursing home culture and dining experience for everyone involved. 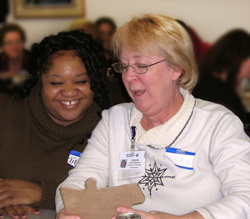 We teach valuable personal and professional skills that will have lifelong application and improve long term care quality. Q: How are the skills that you are teaching different from other customer service program and support different culture change models? Kind Dining® was developed as the result of Cindy’s graduate research which was designed to investigate the influence of staff on the residents dining experience. She concluded educating and training servers would return significant mutual benefits for residents, servers and providers. The foundation of Kind Dining® training is rooted in teaching relational principles around authentic hospitality and treating others with acceptance, respect and dignity. These principles apply to any culture change model and size of organization that serve meals. Q: Can I just order the workbook and Trainers Guide without booking a workshop? The books cannot be ordered separate from the workshops. Kind Dining® is experiential dining service training. The workshop enhances and reinforces the content of the workbook and Trainers’ Guide. We teach knowledge and skills based on a philosophy grounded in research that supports nursing home quality improvement and will help you change the service culture of your organization. Our curriculum is designed to be integrated into your dining service program as you work on continuous improvement. Q: What is experiential training? Experiential training itself is defined by the experts as an approach to individual, group, and organizational learning that engages people, using action, reflection, application, and performance support. With our approach participants recognize the challenges of aging, servers build empathy needed to respect the aging process and to engage the resident on a person to person level. Q: Our dining room managers believe we pay our servers minimum wage and shouldn’t expect more out of them. Can you make better servers out of minimum wage employees? Absolutely. Improving the training of minimum wage employees in nursing homes not only improves their interaction with your customers, it increases their work satisfaction, relationship with their supervisors, and creates a better work environment. Kind Dining training is designed to educate people on the value of making genuine connections, working for common goals and common purpose. Research* validates that feeling connected and doing meaningful work is often times more valued than wage per hour. Kind Dining training provides new skill development, stimulates creative ideas and instills employee commitment to be a better server for you and your customers. *Grant,L,”Organizational Predictors of Family Satisfaction in Nursing Homes.” Seniors Housing & Care Journal, 2004. Q: My staff is very diverse. I employ both teenagers, middle aged servers and people from varied cultural backgrounds, many who speak limited English. Can Kind Dining help my company improve dining service? Yes. Kind Dining® training is designed to appeal to a diverse group of servers. Concepts are easy to grasp, with lots of visuals, limited text, engaging exercises, and universal ideas and principles of learning how to get along. Q: Why do you call anyone who serves food in a community a “server”? In order to create a common bond for the work itself. Whether a person works in nursing, foodservice, or the housekeeping department the principles of service and proper serving techniques apply. Ms. Heilman reinforces the principles in every aspect of the training and materials and believes the continuity of these principles apply no matter the level of care.